The July 20 event is from 10 AM to 4 PM and is included with general admission and free to members! Maker and vendor booths will be nestled around our historic aircraft. This is a one-of-a-kind indoor event that brings makers together! Makers innovate, transform, imagine! Join us in our SPACE ZONE in celebration of the 50th anniversary of Apollo 11 Moon Landing with hands on activities for kids, virtual reality Apollo 11 experience game, and pictures with inflatable astronauts. Makers Market event kicks off with a presentation about the future of space flight from retired Astronaut Clayton Anderson at 9 AM. 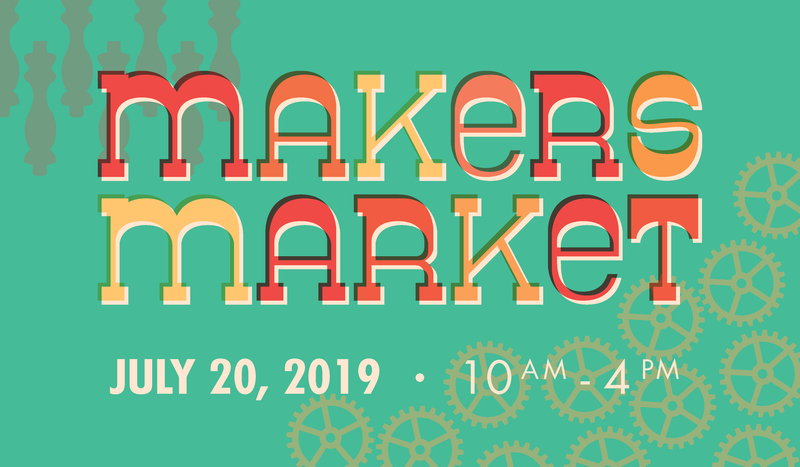 Makers Market booths will open at 10 AM to the public. NEW in 2019 is Hamster Wheel Entertainment. That’s right – you can make your own snow cone with your own two feet! Come experience this uniquely fun attraction. All the participants receive their own snow cone. It is on first come first serve basis. The Hamster Wheel will be here from 10 AM-4 PM. Join Ty Rempe with Ty Makes to view his space themed art, jewelry, and ceramics (available for sale at the Museum) and take a picture with the space themed backdrop, specially painted and donated to the Museum by Ty Makes for this event.